Electromagnetic interference (EMI) can be caused by electromagnetic disturbances produced by an electric device and might negatively affect the performance of other neighbor electric circuits. To insure proper functionality of electric circuits, there are normative regulations, which restrict the amount of disturbances caused by electric devices. Naturally, disturbances arise at harmonics of the operation frequency of an electric device. To attenuate these disturbances conventional, EMI-filters are used. These are low-pass filters, which standardly consist of capacitors and chokes and therefore work in a relatively broad frequency range. At low frequencies, conventional EMI-filters considerably increase the dimension and costs of the electric circuitry or device. Furthermore, a selective attenuation of disturbance peaks is not possible by means of conventional EMI-filters. • The selective attenuation of a specific peak of a disturbance spectrum is possible (see for instance the figure below). This is related to the resonant character of the electro- mechanical coupling of the piezoelectric element. Thereby, geometric dimensions and costs of the overall EMI-filter can be considerably deceased. • Besides the resonance frequency, the piezoelectric element behaves like a capacitor and, thus, can fully substitute a regular filter capacitor. • By a specific design of the piezoelectric element or by connecting multiple piezoelectric elements, more disturbance peaks can be attenuated at the same time. • Many piezoelectric materials exhibit favorable properties regarding insulation and break-down voltages. Therefore, one can substitute regular X- or Y-capacitors. In general, the invention enables reducing size, weight and costs of unavoidable EMI-filters. mode power supplies, line filters, electric power circuits and motor drives. A prototype has been built and successfully tested. 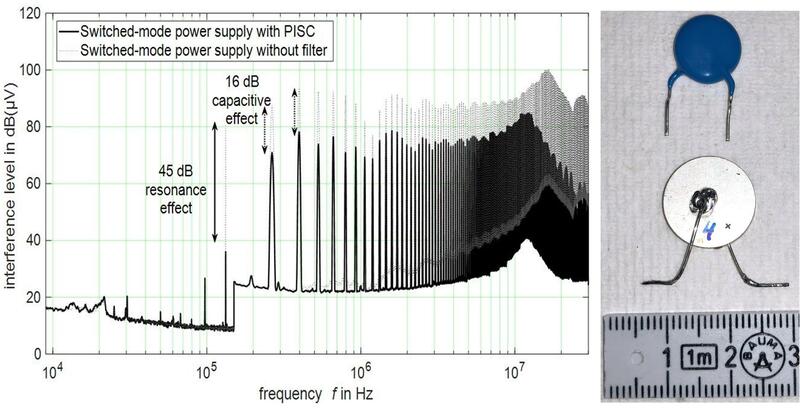 Figure: (left) Exemplary disturbance spectrum; the implementation of a piezoelectric element (PISC) as suppression component enables an improved narrow-band attenuation of a disturbance peak. The piezoelectric element is chosen such that its resonance frequency corresponds to that of the disturbance peak (labeled as resonance effect in the figure). Besides the resonance, the PISC behaves like a regular filter capacitor (capacitive effect in the figure). (right) Comparison of a prototype with a regular filter capacitor. The size of the PICS decreases with increasing disturbance frequencies.